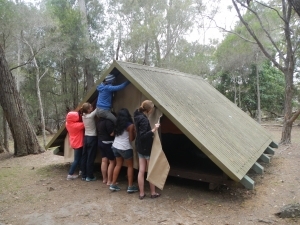 The Field Studies Huts are located at the southern end of Bournda National Park. High on a forested ridge, to the north of Bournda Lagoon, the Hut area has spectacular ocean views. The facility has a timber hut which can be securely locked and is utilised as a wet weather shelter. It has a pot belly stove and is equipped with bench tables and bench seats. 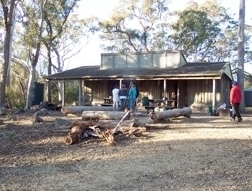 The timber hut is used to prepare and store food and for classroom activities. The Field Studies Huts facility has 4 A-frame structures which have canvas andinsect netting sides attached to the two ends. Groups sleep in these A frames which are a very short walk from the timber hut.The A-frames are raised up off the ground and have a tin roof, protecting students from inclement weather. The A-frames are raised up off the ground and have a tin roof, protecting students from inclement weather. A communal fireplace is a focal point of the camping experience at the Field Studies Huts. This fireplace is located just outside the timber hut. 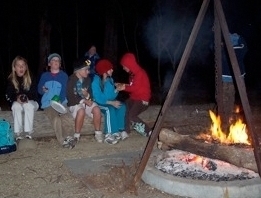 Night time activities around the campfire are popular with students.